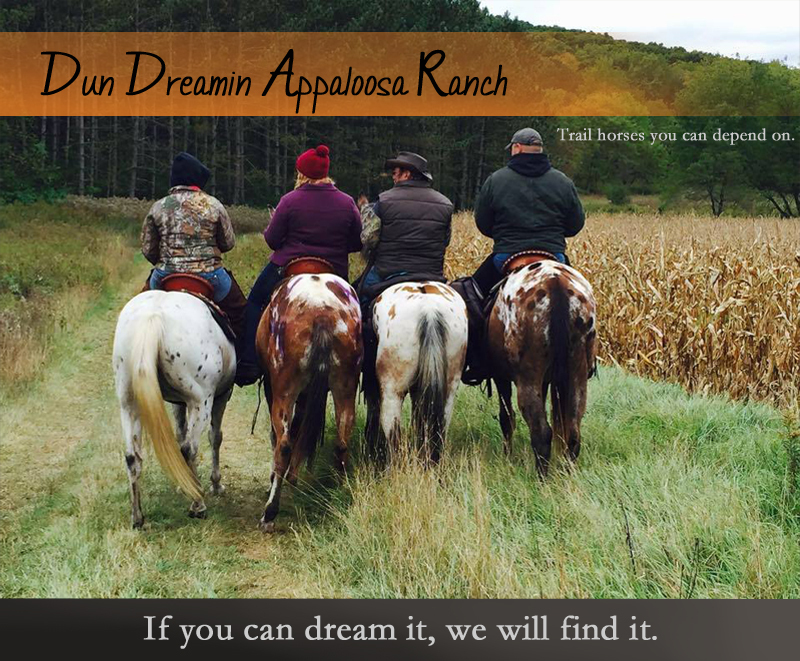 Dun Dreamin Appaloosa Ranch. Trail horses you can depend on. Consider us for a new opportunity. Want to buy a new horse but have to sell yours first? We understand that selling your horse as a private party is much harder and time consuming than selling your horse under a business name. That's what we are here for. Ask us for more information on how to consign your horse off site or on site with us. Not only do we do all of the work selling the horses while you get to be worry free, we also keep up on all of the feeding, vet bills, and training! We would love to help you out and help you find your horse a new loving home. $500 nonrefundable deposit to hold, must be paid in full before leaving. 7 days free board after purchase. Hauling arrangements can be made. Pre-purchase exams welcome at buyers expense. If paying with personal check, check must clear before horse leaves. Paypal welcome, but there is a 3% fee. Click here to see my testimonials page. We are a small horse ranch specializing in buying and selling dependable trail horses. Located in Amberg, Wisconsin, 70 miles North of Green Bay, we began breeding quality Appaloosas with wonderful temperaments, great conformation and excellent pedigrees, particularly with the beautiful dun and buckskin colors. In recent years, we have redirected our program and grown into a reputable horse ranch with a consistent variety of good broke horses for sale ranging from ponies to gaited horses, and every stock horse type in between. Although our focus has moved from breeding Appaloosas to primarily riding and selling good trail horses, we still pride ourselves in our beautiful herd of Appaloosa mares and geldings. We do still raise a few Appaloosa foals with a new goal to breed Appaloosa mules. All of our horses, those in our sale program and our personal riding horses, are loved and cared for on an individual basis. Every horse that comes to our farm has a current coggins and vaccinations. We work closely with our vet and body therapists to ensure any dental, chiropractic, or massage work a horse might need is done properly. Regular deworming and farrier visits are maintained. We treat each horse like our own so he is healthy and ready for his new owner. All of our sale horses are handled daily. Many hours of refreshing and training goes into our sale horses so we can fix any vices or issues the horses come to our farm with. This enables us to sell good horses that are in shape and ready to be your partner. We do not purchase horses from auctions, nor do we sell horses at auctions. We buy our horses from private parties, and many of them are here on consignment as we do the refreshing and marketing to get the horse sold to the right home so the owner doesn't have to do any work. We don't deal with bucking, rearing, or bolting horses. Any horses who truly have bad issues go right back to their owners. We pride ourselves in good quality dependable horses that are safe for the entire family. My passion for good trail horses, especially Appaloosas, began when I got my first horse in 1985 when I was 10 years old, a beautiful Appaloosa weanling filly named Lisa's Cheers. She sadly left us in 2017 at 32 years old. We grew up together and learned so much from one another. She was one special mare and is irreplaceable. She helped me live the life I always dreamed about. She also inspired my love for the Appaloosa breed. This mare had the heart and spirit all horses should have. I hope to help everyone find a horse as special to them as Cheers was to me. If there is a particular horse you are looking for, send me the specifics and I will search until I find the right horse for you. All Rights Reserved. Created and maintained by Serenity Anderson.